Interactive sites were added by Lichelle Leonard. Web 2.0 presents opportunities for teachers to build higher levels of engagement in the classroom. Giving students the ability to think critically about transferring skills and knowledge to new creations teachers use Web 2.0 to encourage students to view themselves as active agents in the transfer process. The impact of Web 2.0 has instrumentally changed the way students learn and in return the way teachers must teach. 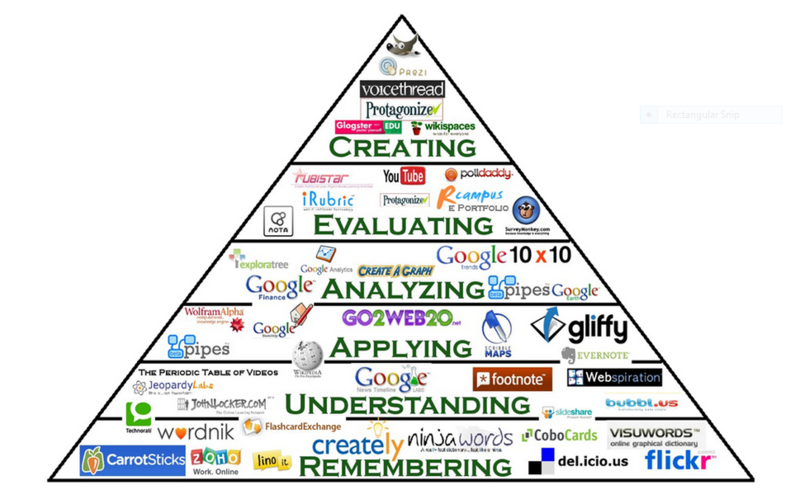 The number of Web 2.0 tools continues to grow while utilization of these tools supports constructivist pedagogy. The interactive nature of these technologies lends itself well to collaborative learning, which motivates students, creates a “safer” learning environment, and enhances knowledge and skills. Rather than being a passive viewer on the internet (Web 1.0), users become creators, collaborators and actively engaged with Web 2.0 tools. Web 2.0 and Social 3.0 have captured the interest and the imagination of students, educators and researchers. It has had a significant impact on instruction and learning, in the context of the 21st century education and we cannot imagine where it will lead us next. As educators discern which tools to use, thinking of tools in terms of students level on the hierarchy of revised Bloom’s Taxonomy will help place an appropriate understanding. But beyond the level of creation, educators must think of their 21st Century students as extremely social beings. This socialness often comes with a veil of interaction where the participants have never met face to face and often can only be identified with an avatar. This is where it is critical that teachers begin taking responsibility for educating this new generation of internet users as responsible digital citizens. There is a lot of dialogue about teaching students to be digitally literate and to understand their responsibilities in a digital world. Teachers cannot teach digital citizenship if they have not worked with it themselves. They must experience it and model t for their students. How many of you work with a teacher that has her face planted in her phone all day at school? Would this be modeling digital citizenship for your students? How many know a teacher that sits behind her desk at her computer all day? Is this modeling digital citizenship? Our students are watching. Please be careful with your own technology habits as you encourage positive usage in your students.